RBI hikes Policy Rates by 25 bps – Forecasts Stable Growth! It’s like – if you are wounded, then tighten the noose slowly and gently, but surely. The noose should not further hurt your wound and yet provide you protection from the outer world. Yes, that’s what RBI seems to be doing rather well – ensuring that a rate hike is trickled down into the system at a gradual pace to tighten a noose around increasing pricing pressures thriving in a typically buoyant economy. The central bank raised its key short-term lending and borrowing rates by 0.25%, or 25 bps, with an eye on spiraling inflation as a major concern. The RBI has been on a rate hike spree during the fiscal for as many as 6 times since March 2010. The RBI policy rates of repo and reverse repo stands at 6.5% and 5.5% respectively after marking a 25 bps hike with immediate effect. However, the apex banker has kept CRR – the amount of funds that banks have to keep with RBI – untouched at 6%, to ensure flow of adequate liquidity in the hands of banks. In December, the headline inflation shot up to 8.4% on a year-on-year basis, driven primarily by food and fuel inflation, after temporarily moderating to 7.5% in November. 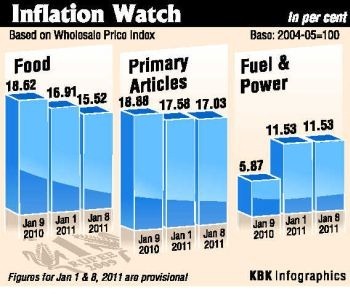 The WPI inflation had hit a peak of 11% in April last year. Considering that the household expenses have remained elevated for long, the RBI has revised its baseline projection of WPI inflation for March 2011 upwards – to a more realistic 7% from 5.5% forecasted earlier. The central bank also raised concerns on the prospects of high food prices spilling over to the general inflation. Most of the times, a central banker has to deal with tough decision to choose between growth and price stability. And an even tougher job is to adopt a stance that needs a balanced approach between growth-inflation dynamics. Therefore, a rate hike was unavoidable albeit at a slower pace with a sequential approach. In a pleasant note, the RBI has retained its growth forecast for 2010-11 at 8.5% with upward bias; and further said that growth has moved close to its pre-crisis levels as reflected in the 8.9% GDP growth in the H12010-11. However, RBI expects GDP growth to decline somewhat in FY12. The RBI sternly indicated that the country’s improved fiscal situation was simply a feel-good factor, driven by one-off revenues generated from spectrum auctions and government’s disinvestment proceeds, which may not be sustainable in future. Further, if the government does not bring down its share of subsidies on rising oil and fertilizer prices or make budgetary provisions for such expenses, it will constrain its ability to reduce the fiscal deficit and undermine its fiscal credibility. RBI has forecasted the current account deficit to be close to 3.5% of GDP for the year. Country’s trade deficit is going to widen in the current fiscal and is likely to be around $115-125 billion. With all the hoopla surrounding rate hike, what concerns me is whether the surge in interest costs will succeed in curbing the inflationary impact most of which is driven by supply constraints? If not, it will simply make it unbearable for the aam-aadmi to pay off their rising EMIs for home and car loans. Do you feel RBI is moving on the right path with its rate hike approach? What particularly i feel is increasing base points again and again is not a solution for keeping inflation under check, it is only a part of solution . RBI has to see that inflation is continuously increasing even after the rate hike . RBI has to opt some other means to pull out liquidity from the market. I think a hike of 0.25% would help to curb inflation for a shorter time…but then something bigger cant be achieved from this….atleast a hike of 1% is needed…then can be hoped for curbing inflation to some extent..
Are they kidding me (or us)? 0.25% raise would do nothing. I was hoping for at least a percent to go up. The “real” 2 digit inflation will not be affected by this tiny-winy rise. I hope the banks will not jump on to this opportunity to squeeze extra rupee from home loan and auto loan holders. I feel govt has failed in containing inflation by its inaction. And it is punishing people for its inefficiency. In so many instances it could have been proactive. I give one example. Rajasthan oil fields where ONGC and Cairns are partners (30:70 ratio). Due to some lousy set of rules ONGC is asked to pay tax for the entire quantity of oil produced while Cairns is left scot free. The situation for ONGC is such that if the output is increased it has to pay more tax. So though there is scope for substantial increase of crude oil, it is refusing to increase, while India as a whole is importing oil from int’l markets. ONGC is willing to pay tax only for 30%as it is a share holder for 30%. But govt insist ONGC to pay tax for Cairn also. All the govt has to do to save the country is agree to ONGC request to pay tax only for 30%. All it requires is awareness of reality. Govt lacks it. Another example. When onions are flying in the sky, govt started importing from Pakistan. Though prices started rising, Pak is happy to earn some forign currency. India is happy to get some onions in market. All of a sudden India stopped cotton exports to Pakistan. In retaliation Pak stopped onion exports. Who lost? We lost the chance to import precious onions. Who suffered? Ordinary citizens. We can talk about so many issues which have gone by. But as a responsible govt, it has to foresee events which are about to happen. Like the present salt issue. This year due to excessive rains in the unusual prolonged rainy season, salt production is expected to go down by 40%. Its obvious that prices will go up not only for salt for edible purpose but for industrial purpose also. Salt is used to make caustic soda which is used to make detergents. With in 3 months salt prices and washing powder prices will go up. Now lets see what govt does here. If it has any foresite, it has to look for imports of salt immediately. All the ministries are busy with scandals and no body has time for proactive governance. No surprise inflation will go up. RBI rates go up. Our suffering will go up.